I felt it was quite 'o.k'. What do you think..give me your feedback which may influence the possibility of me wearing skirts in future! I have made one more skirt (same fabric) of same style for my sister, still have little fabric left to squeeze in one more little skirt for my daughter, once that is done, shall post the snap of '3 musketeers' in twirly skirts! Fabric is seersucker cotton, which has been lying around for more than 2 years now! the silver trim i had hoarded long back, fell absolutely in place with this fabric. What i love about this skirt - Its very comfy and airy - perfect for blazing summer! and its TWIRLY! What i hate about this skirt - Well ... NOTHING! hmm at first glance, I was wondering hem should have been extended by couple of inches, but after having worn it, i felt comfortable and confident to lounge around in it! Nice Skirt...... I would suggest to add silver trim on first attachment(I don't know what should I call it) also. Thanks Rathnapriya. 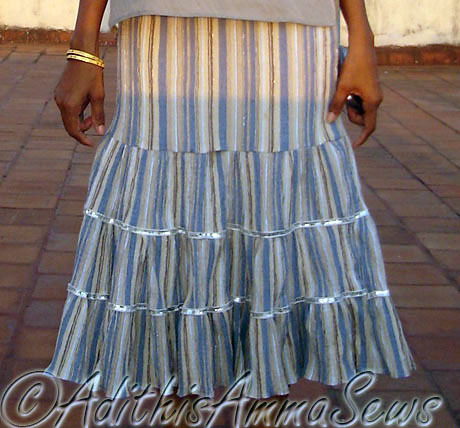 This is an easy skirt to draft, will post a tutorial on its draft soon. Thanks Shalini. I did not add the trim on the first layer or the yoke portion of the skirt as the fabric is seersucker and is elastic and i have stitched it close enough to drape the hips, so if i add the trim the elasticity of the fabric will be lost. Very nice!! You should wear more skirts. Following from The Creative Girl Blog Hop. Happy friday blog hop! I am your newest follower, both GFC and NB. tnx! Wow, your skirt is so twirly! Great job! 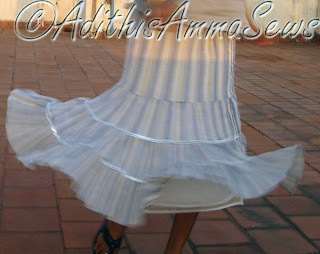 Love how your skirt twirls! What fun! wow!! Well done.. thats a lovely skirt!! Beautiful is the word..I just loved your blog! Please, visit my decor blog RAINBOW-The Colours of India.